Touchless Car Cover | A Revolutionary Car Cover | Why TCC? • No damaged paint due to scratches from dust or dirt - Most of the damage to a car's finish is from the constant moving of dust and grit from putting on and taking off an old style car cover. Not with the Touchless Car Cover. 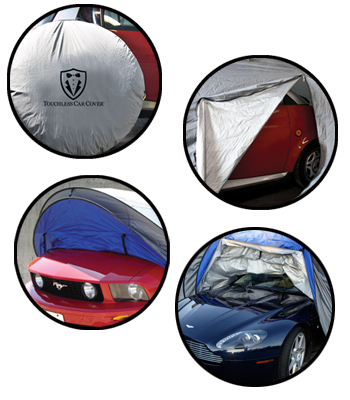 • Easy storage - The Touchless Car Cover comes with it own zippered carrying bag. • Drive in and out - easy to set up and use! - Click here for directions on how to set up your Touchless Car Cover for convenient drive in and out, in your garage or storage area.